After two days on the hill with the Tweed Valley Mountain Rescue team one of the main impressions I’m left with, apart from the high levels of competence and professionalism of everyone involved, is how well they work together as a team. 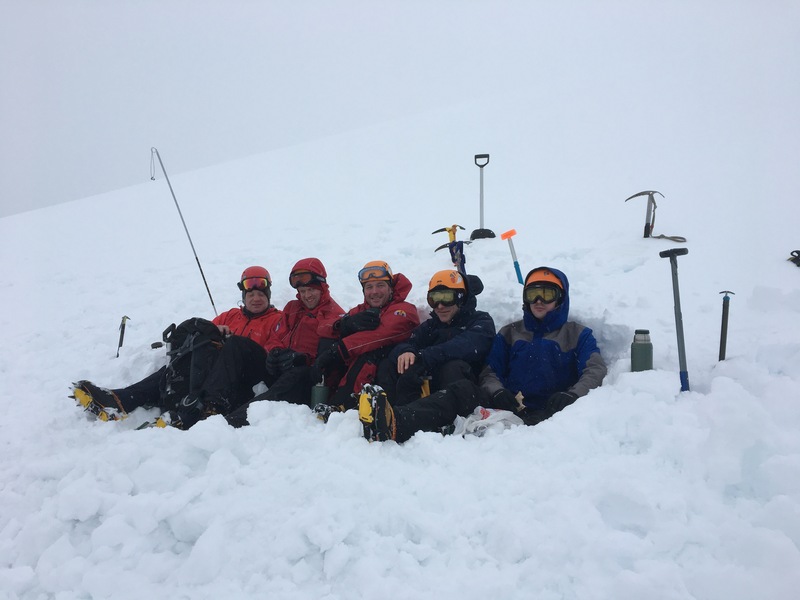 The true test of that, of course, is being on the hill in bad weather when conditions are tough and when looking for a casualty in a rescue situation. It been a real pleasure this weekend supporting team with their annual winter skills weekend, working with a group of 5 guys practicing winter skills. 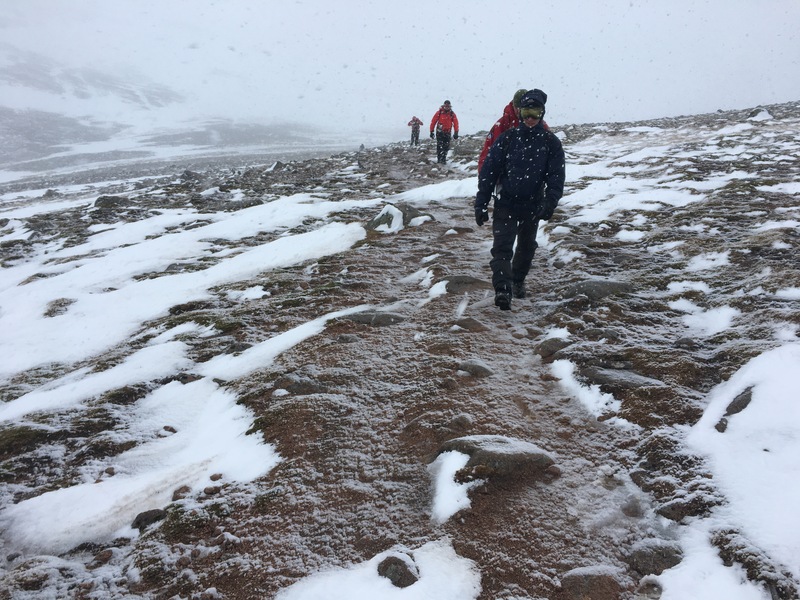 In winter conditions it’s pretty evident when a team is looking out for eachother – sharing food, helping to adjust your pal’s clothing, slowing up to keep the group together, sharing out breaking trail through the snow: lots of little things that make a huge difference when the weather is bad and you need to function effectively as a group. These guys had all of those qualities. The weather and snow conditions changed a lot this weekend. Friday was cold with accumulations of windslab on northerly slopes; Saturday morning was mild with rain and thawing snow; mid afternoon it was cooler, sunny and pleasant; overnight the stars came out and the snow firmed up; Sunday morning we had cruddy crunchy firm snow and at higher levels there was ice and fresh snow was being transported about by the wind; and, in the afternoon milder conditions again with sleet and quite heavy rain. So lots to think about and deal with in terms of avalanche awareness and personal management. On Saturday morning we spent time reviewing the weather and avalanche forecasts to plan a journey, thinking about the balance of decision making that happens ‘at home, on your mountain journey and at key places’ (see this link to the Scottish Avalanche Information Service for more info on this decision-making approach to avalanche awareness). On the hill we practiced lots of navigation skills: pacing and timing, strategies for planning navigation legs in poor visibility, footwork, some step cutting and self arrest. 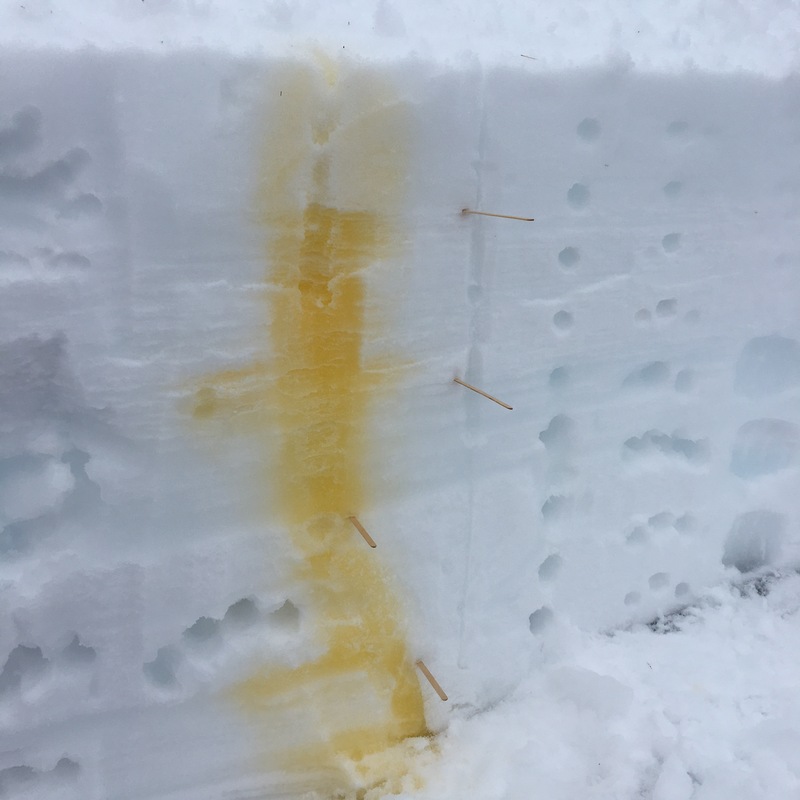 We also spent some time looking at the snow pack for snow layers (it’s orange juice by the way). Sunday was more wintry and the snow more stable after the previous day’s rain and frost overnight. 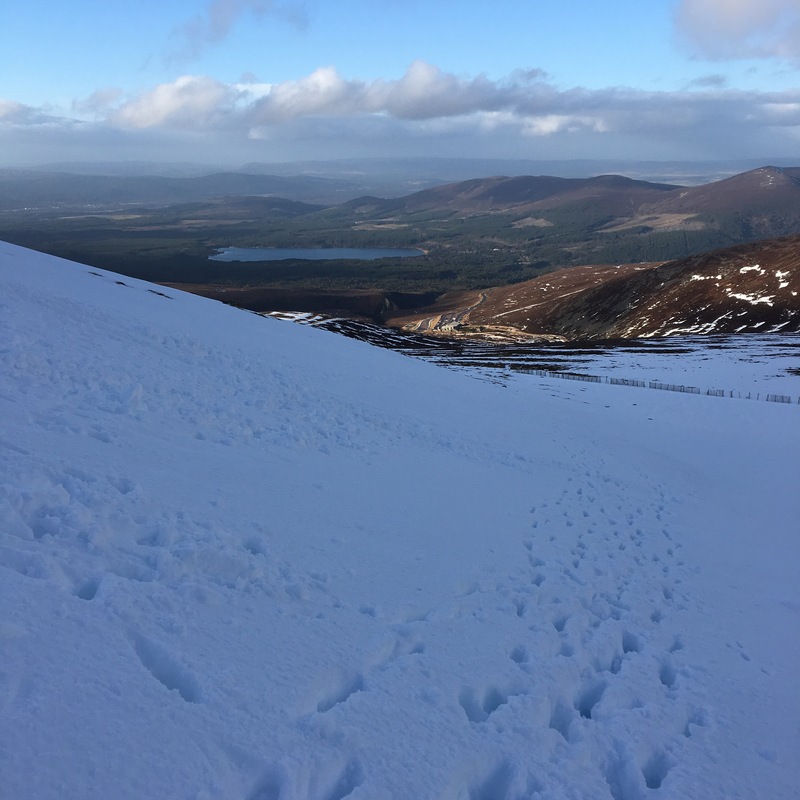 So we headed to Corrie an t-Sneachda and found some ice to practice crampon skills. Then we headed up the Goat track on steep ground to the plateau where we practiced more nav and discussed techniques for re-locating in poor vis. In the afternoon we journied west over Cairn Lochan and the back to the Coire Cas car park. 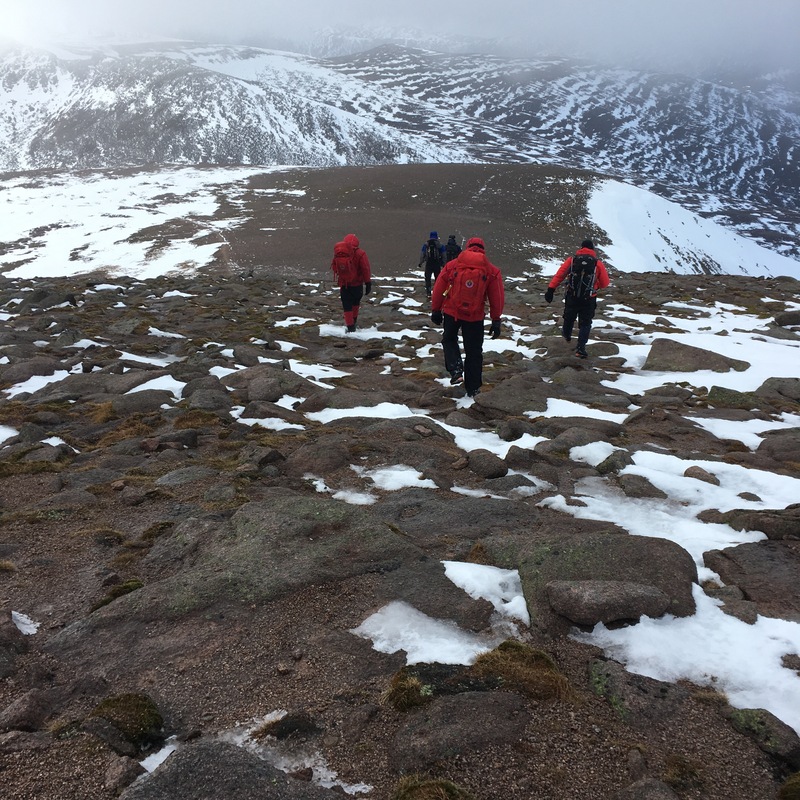 For my hill running friends reading this blog, you’ll be interested to know that Tweed Valley Mountain Rescue were the team providing cover for the Carnethy 5 hill race last weekend, in wild and windy weather. Very interesting and enjoyable read.